Dollman Kills the Full Moon Universe #6 – AiPT! Full Moon fans rejoice! The finale of Dollman Kills the Full Moon Universe is here and it is amazing. After a hiatus for issues #3-5, I am back to review the final issue of Dollman Kills the Full Moon Universe. This isn’t to say that those issues were bad — in fact they were BADass! Dollman mixed it up with Killjoy and his girlfriend Batty Boop. He also tangled with other Full Moon favorites such as Gingerdead Man, Killer Eye, the Seed People and partnered up with Doctor Mordrid. 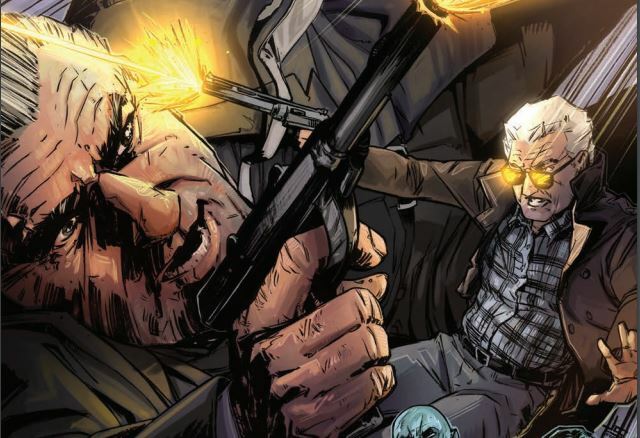 The fifth issue ended with Dollman looking eye to smaller eye with Jack Deth, the hero from the Trancers films, who ironically enough is played by the same actor as Dollman, Tim Thomerson. Come to find out, Dollman has royally screwed up the universe and Deth has come to salvage it. Dollman has done more than destroy the Full Moon Universe. He has disrupted and altered the entire timeline, which is going to prove catastrophic! Enter Jack Deth. Jack is a police officer/trancer hunter from the 23rd century who uses a method of time-travel to inhabit the body of his last known relative, Philip Deth. Deth has gone back to Bardo’s present time to let him know that he has unleashed an unholy evil when he killed the Master way back in the first issue. Apparently, the Master was the gatekeeper to whatever hell he occupied. Well, with no one minding the animals, a pretty wicked looking creature found his way out and has gone a killing spree. But that isn’t all! Each part of the universe that Dollman eradicated had an after-effect that is slowly destroying the timeline. Now that Deth has found Bardo, will they be able to go back and straighten the universe out and make things right again? I like how the events come full circle and take the story to another level. There is more depth than just a violent bloodfest. Don’t get me wrong, I absolutely love bloodfests, but a deeper story is a nice addition. Dollman has wasted all the gruesome monsters in the universe and now he has opened multiple gates of hell. It’s a sweet spin seeing that these terrifying creatures actually play a role in keeping the universe centered. Goes back to the “evil you know and the evil you don’t.” I applaud writers Brockton McKinney and Shawn Gabborin for taking this direction; it certainly was a twist I wasn’t expecting. The theme of tale quickly becomes “If you don’t know, don’t f*ck with it.” You think you know what’s best and sometimes it’s best to just leave well enough alone. Who knew a gruesome horror comic could share such a true message? And I’m gonna say that I loved seeing Deth show up in the finale! Daniel Pascal and Simon Robins have done a fantastic job throughout the series with their artwork. All the Full Moon creatures look fantastic and the colors fill the pages with doom and gloom. And there is plenty of blood and gore for horror fans! This is precisely the comic Full Moon fans deserve. I don’t have any complaints with the book. If you have been keeping up with this series as I have, then I am sure most will agree that this is a great finale and hopefully McKinney and Gabborin keep more stories coming with the new Full Moon Comix brand. That monster with a mouth for his stomach isn’t a pretty dude. I would have liked to have seen Deth and Bardo tangle with him! Buy it! Even if you aren’t familiar with the Full Moon Universe, this series is an excellent starting point. You get to see a lot of the more famous characters and the evil they do. Then you get the joy of tracking down their respective movies and seeing them on the screen! I even had to go back and purchase the Dollman series after reading this because I lost mine a few years ago and very much wanted to re-visit the films. Dive into the Full Moon Universe — if you are a fan of horror, blood, guts, and babes, you won’t be disappointed! A fitting end to an entertaining tale from the Full Moon Universe.